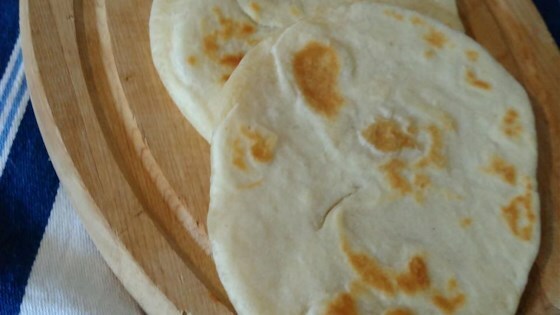 "Piadina is an Italian flatbread from Emilia-Romagna region. The traditional recipe calls for lard in the dough which you can replace with a good extra-virgin olive oil. It is typically served stuffed with prosciutto and a local cheese called squacquerone but any soft cheese will work. Enjoy!" Mix flour and salt together in a large bowl. Mix in water a little at a time. Rub in lard until dough comes together in a ball. Transfer dough to a lightly floured work surface; knead until smooth and elastic, about 10 minutes. Divide the dough into 6 pieces; roll out each piece to 1/16-inch thickness. Heat a dry, heavy skillet or flat griddle over medium-high heat. Cook each piece until golden brown, about 2 minutes per side. This is perfect. Just like the Italian restaurant I love.